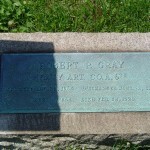 In the 200-year old yard of the old Bull Creek Presbyterian Church, just north of Pittsburgh, PA, lies the grave of our last connection to the American Civil War and the family that lived before: Robert Patterson Gray (1844-1928). His middle name was his grandmother’s maiden name, and she was born near the end of the 18th century. The tombstone and the flag bracket both indicate proudly his service to the Grand Army of the Republic (GAR). Great-grandfather Robert was born an April fool’s baby, small in stature [see “Memories of My Mother Ruth: Part II” for some impressions of him in his last years]. We don’t know anything more about his early years but that he enlisted with the Union cause on August 30, 1864, toward the end of the struggle. He would have been only 20 years old and served with Company A, 6th Pennsylvania Regiment, Heavy Artillery. 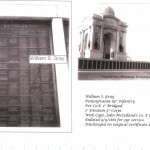 The online records from Pittsburgh’s Soldiers and Sailors Hall list four Robert Grays, but none confirm those details. Surely more research and perhaps a trip to Pittsburgh is needed. Incidentally, there are five Williams listed in Pittsburgh’s Civil War records. One was Robert’s father. Although military service is not mentioned on his stone at Bull Creek Cemetery, Bates says that he enlisted in September of 1861 for a three-year hitch but was “Discharged on a Surgeon’s certificate – Date unknown.” We know now that he was honorably released on November 15, 1863, but we don’t know what the medical reasons were. [For more on William and Robert’s brother Samuel, who served in the same Regiment, see “Samuel A. Gray; Part I – The Civil War.”] Family enlistments like these were not unusual at the time, but William would have been in his mid-40s with major obligations to farm and family. I’m certain his return was welcomed. 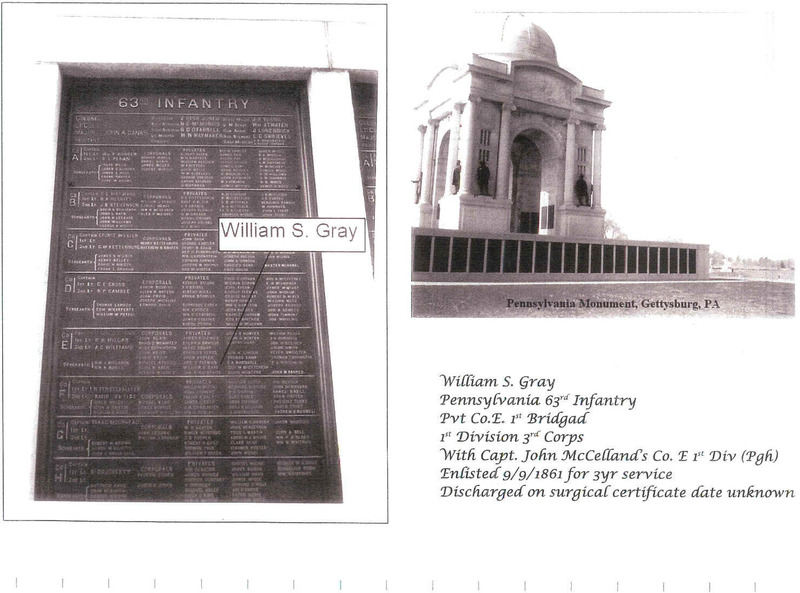 Many of the Grays, including my grandparents, are also buried in the Bull Creek Presbyterian Cemetery, West Deer Township. Researching family from over 140 years ago is never easy, and our Grays are no exception, but one source lists a Robert P. “Grey, ” Private, enlisted September 1, 1864, and mustered out with battery, June 13, 1865, so we’re certain that this is our Robert. As we indicated in the article on Samuel Alexander Gray, Pennsylvania began to recruit soldiers for the war almost immediately after the attack on Ft. Sumter in April of 1861. About 75,000 men were sought three months to serve in 25 regiments in the beginning. The Northern side didn’t draft anyone, however, until two years later, when volunteers waned. By the time Robert turned 20, “The Civil War Military Draft Act of 1863” with its annual amendments called all men between the ages of 18 and 35. Just a year earlier in New York, riots had broken out over the loop holes and class discrimination of the draft. Of the quarter-million men called, only about 6% actually served, the rest paying commutation of hiring a substitute. But we know that Robert’s 6th Regiment had originally been formed at Harrisburg, April 22, 1861, and moved to Philadelphia to protect the railroads. This early unit was infantry and was mustered out after only three months. Another 6th Regiment, called the Reserves Infantry, was organized in Harrisburg in June of ’61 for a three-year period, trained at Camp Biddle, Greencastle, and moved to Washington, D.C. the end of July to protect the nation’s capital. This 6th Regiment saw some of the worst fighting of the war, including Manassas, Antietam, Fredericksburg, and Gettysburg. It lost a total of 183 of its 1,046 men, including 3 officers, and 107 enlisted men, and another 73 to disease. Ironically, it was on duty around Alexandria from February 6 to June 25, 1863, just before Samuel Gray was captured at Chancellorsville and imprisoned at Alexandria. It was officially mustered out on September 9, 1864, nearly the same time that Robert joined. Yet another 6th Regiment was called the “Militia Infantry,” which was called for only three weeks in September of ’62 to repel Lee’s invasion of Maryland. It was an enemy’s country, and infested with roving bands, military and civilian upon occasion, and to guard against surprise, and to be at all points superior to an attacking force, requiring incessant watchfulness and skill in the disposition and handling of the guards. The discipline, which had thus been acquired, now served a most important purpose; for it was only by the strictest attention to duty, and the exercise of sound discretion, that the wily and watchful enemy could be kept at bay. To go outside the lines was almost certain death. By mid-November Sheridan abandoned the railway, believing that the Shenandoah Valley was safe. Robert’s 6th Regiment was ordered back to Washington and one of the forts surrounding: Marcy. Now, with more time to train, the 6th was “instructed in heavy artillery service.” Called “The Battery,” the regiment probably had six cannon and as many as 144 men led by a captain or lieutenant. All during the winter months of ’64-’65 and until the victories of Grant and Sherman that assured the end of the war in April, the 6th remained on duty in the forts covering the nation’s capital. They were mustered out from Fort Ethan Allen, one of the most northeastern along the Potomac, on June 13, and returned to Fort Reynolds near Pittsburgh by rail, where they were released on the 17th. 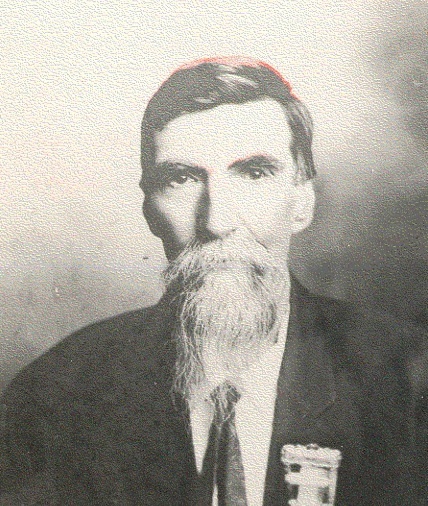 Robert Gray’s story is not unlike that of William S. Marshall, also of West Deer Township. His story is told in Memoirs of Allegheny County, PA and available online. 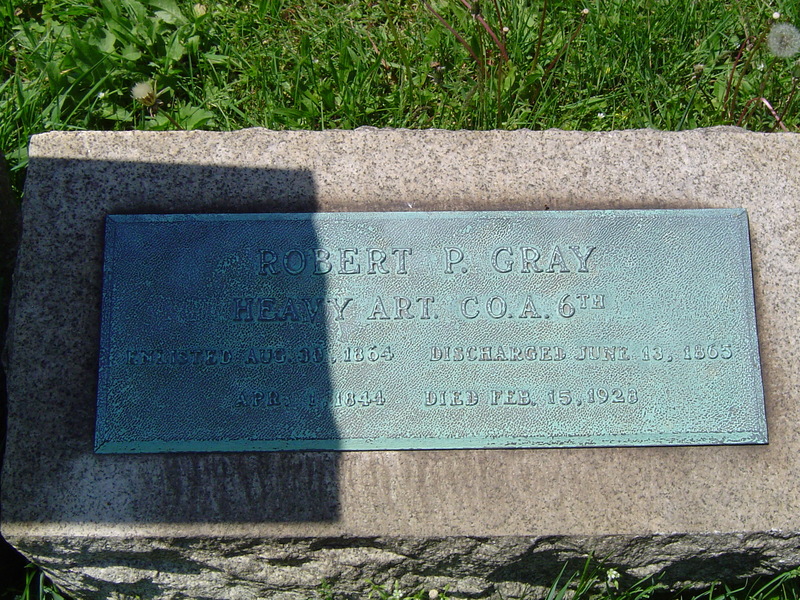 Like Robert, his neighbor was a successful farmer, with about 100 acres, and part of the 6th Pennsylvania Heavy Artillery, Company A. Marshall was known as a breeder of high-grade Holstein cattle. He was a Republican and Presbyterian, as were most of the Scotch-Irish in West Deer Township. We mention these details here with the hope that they will help us better understand the culture from which our ancestors came. Robert only served nine and a half months and a limited area in the Civil War, and though he probably didn’t see all the horror that his brother saw in three years of service over a much wider area, he no doubt came to understand the futility of armed conflict, particularly between citizens of the same country. 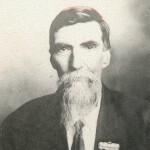 Samuel enlisted, whereas Robert was probably drafted, but both appreciated the call to duty and being away from home and family. Almost a century and a half later, I have not wandered far from the Western Pennsylvania farm of my Great-grandfather Robert and his father William. I can only imagine their struggles to provide for their families then. But, I also have a great appreciation for Great-great uncle Samuel, who upon returning from the terrible conflict, sought his fortune much farther west, truly the American frontier then. In conclusion, knowledge of the lives and times of these ancestors makes us all richer and wiser. I hope that your enjoyment in reading our family history is as great as the satisfaction I have in researching, writing about, and posting it.